Doug Schnitzspahn » Blog Archive » Confetti on the Charles? Baseball Prospectus has posted analyses of how each MLB team can win the World Series. He also runs down all the reasons why the ’07 Sox could crash and burn like last year’s version. Here you go: old (Schilling, Wakefield), unproven (Matsuzaka, Papelbon), and erratic (Beckett) starting pitching. No closer (Joel Pineiro?!). Injuries waiting to happen (a.k.a J.D. Drew). Of course, if that rotation hits its stride at the end of the year and someone like Brendan Donnelly comes back from the dead to shut the door, there will be confetti on the Charles. I’ll be watching Donnelly. He has reinvented himself before (or is that reinjected?) to bust out of the minors after 10 years and seems to have the mental makeup to do it again. I’d rather see the starters begin the season a bit rough and then dial in for a playoff run (like last year’s Cardinals). Somehow, I think Beckett is the key. If he gets hot and lives up to his potential, this team will be on fire. The line up can hit (if Drew stays healthy/motivated and Crisp and Pedroia blossom it will crush). I’ll also be wathcing for chemistry. 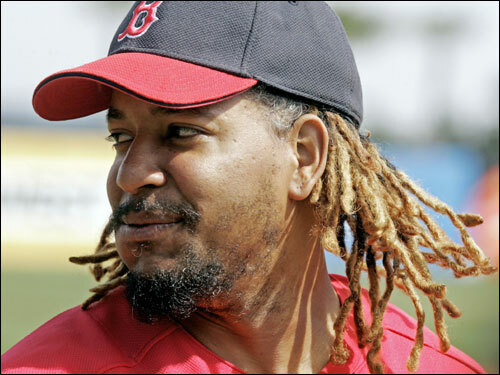 Somehow the Red Sox just don’t seem like the Red Sox since Pedro has been gone. It wasn’t just his hall-of-fame ability, there was something about his aura, his personality, his connection to the city. For now these guys (excpet maybe for Ortiz, Varitek, Shcilling, Manny) seem like the typical mecenaries the Yankees have been marching out on the field for the past 7 years. And speaking of the Yankees, they have been so quiet and obviously pissed off about last year, that I wouldn’t be surprised if they play with a true motivating chip on their shoulders. But of course this is all gut speculation. Look to the Prospectus and Sons of Sam Horn for proven geeeky by-the-numbers predictions. really good article. Ready to hear more next week,my blog http://www.zimbio.com/Wedding+Invitations/articles/4ErXz6GdreH/Adressing+Wedding+Invitations+Envelopes Many Thanks…. I have spent a bit of time going through your posts, more than I should have but I must say, its worth it! http://blue071.sunteu.ro/2011/05/07/select-a-dress/ many Thanks…. I have spent a bit of time going through your posts! http://denisse.meinblog.at/ ,i had a good read….